Choose from a wide variety of Medion laptops and smartphones. Special offerings such as free deliveries, extended warranties, and discounted rates are also up for grabs. You can go over our list of latest cheap Medion deals and offerings brought to you by our community of bargain hunters. Our team of awesome bargain hunters has selected the best and latest special offers and deals from the most trusted retailers including Argos, eBay, and Amazon. Get big discount rates against the regular price of the laptops and mobile phones that you want to buy. Millennials nowadays obviously can't go on without laptops or desktops. That's why Medion, a partner of Lenovo, offers products that will suit every type of users. Medion offers a wide range of models where you can choose and pick exactly what you want. If you are looking for a cheap but good laptop then you have come to the right place. 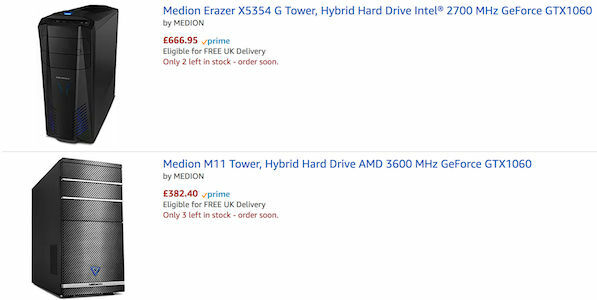 Here at Latest deals you will find the best deals on popular Medion gaming pc in the UK. Find great deals, special offers, price drops, and bundles on a wide selection of cheap Medion deals. From brand new to secondhand and cheap Medion Akoya E2228T, Medion S3409, and all Medion laptop Aldi offers, you are sure to find the cheapest laptop or PC from Medion shops and other UK retailers. Grab this German quality and engineering that you can use for a long time. Find all the best and top-selling Medion Akoya laptops here and so much more. We have a massive community of bargain hunters here at Latest Deals who regularly share verified Medion deals, price drops, and discounts across the country. On the other hand, our team of money saving experts will always provide you with essential tips and tricks that will be able to help you save on your instore and online shopping. Most UK retailers regularly have sale events, clearance, and flash sales where you can save as much as 50% off on a wide selection of Medion products. Watch out for their Black Friday, Cyber Monday, and Boxing Day deals where their prices are reduced even further. If you want to maximise your savings, make sure to use the latest Medion discount codes we have here. We also have voucher codes where you can get freebies or free shipping. Find all the best deals on Medion laptops here at Latest Deals! If you want a new and fast laptop for gaming or business works, you should consider Medion laptops. If you are looking for cheap laptops with decent specs, Medion Akoya E2228T and Medion S3409 are most recommended. Medion laptop’s battery life runs longer than any ordinary laptop. You can not only enjoy gaming but you can relax watching films and using the internet over a wi-fi connection - so you know your Best Buy laptop. Medion laptops performance are fast and almost don’t lag. So whether it’s connected to the internet or not, you can fully enjoy playing. With its high quality graphics design, you can never go wrong in Medion where it’s gaming laptops are made to give gamers a whole new better gaming experience that starts off with what you see in your screen. Budget. Your budget is the ultimate factor which decides on what you are going to buy. There are different kinds of laptops out in the market that may be what you are looking for. Depending on how you will use it. There’s a gaming, student, and business laptops. So, first, decide on how much you are willing to spend on laptop. Processor or CPU. The speed of processing is the main reason of why you are buying or upgrading a laptop. The main part of the laptop is the CPU. Most of the new laptops in the market comes in two brands: Intel and AMD. i7 is a recommended processor with its super fast processing speed. RAM or Random Access Memory. For helping speeding up the processing of application, RAM does the job. It is the physical memory of any computer system and if you want to do tasks like video editing, more than a 4GB RAM is most likely what you will need. Hard Disk Drive. If you are wondering where your documents, software, videos, images and other system files, hard disk drive is what’s keeping them. Most low priced laptops come with 320 GB but you can upgrade it for 500GB up to 1TB. Battery. As a laptop is a portable device, without having to plug it whenever you need to use it, battery decides on how long you can use your laptop. So, battery is one of the main factors you should consider before purchasing one.